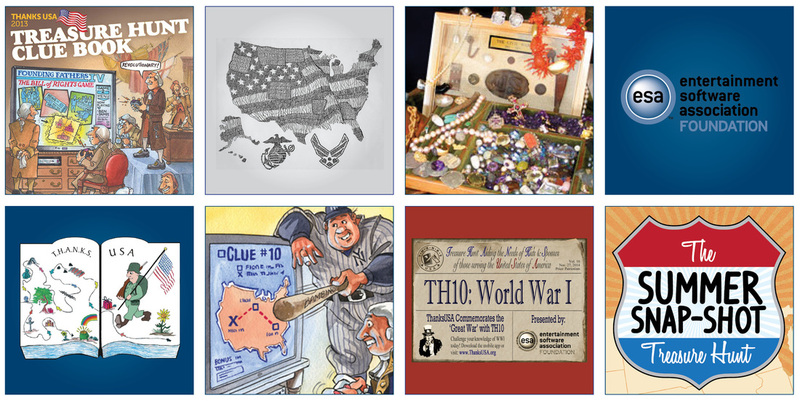 ​For ten years ThanksUSA’s Treasure Hunt spotlighted America’s history and values and, by doing so, promoted the funding of scholarships for military families. The time has come for us to dedicate all of our time and resources to providing those much-needed scholarships. Even so, ThanksUSA will continue to make past Treasure Hunts available on our website – browse by year to the right. Our heartfelt appreciation to The ESA Foundation for seven years of underwriting the Hunt. Their generous sponsorship also allowed ThanksUSA to award 166 ESA Foundation/ThanksUSA scholarships valued at nearly $500k! Thank you to the hundreds of individuals, families and classrooms that have participated over the years. Of course the Treasure Hunt would not have been possible without our resourceful and enthusiastic volunteers, including LCDR Timothy Castle, USCG (Ret. ), Carolyn Ferek, Douglas R. Fink, Frank Gregorsky, The Koch Family, The Okun Family, marvelous fact-checker Tom Thompson, and our one and only mascot Miles the Beagle.